The most pointless Stealth Force Beta mission was Operation Crawlspace, with the goal of getting into every crawlspace on campus. Tech's undergraduate dormitories came in a wide variety of designs: Driscoll Hall was the frilly girls' dorm, Fitch was the old-fashioned Spanish architecture men's dorm and Presidents was its female corollary; Baca Hall was the thin-walled co-ed "quiet" dorm (the residents were quiet because the building wasn't), and West Hall was the rowdy bomb-proof cinder block men's dorm that was the closest thing Tech had to a fraternity hall. South Hall was built in the architectural style of a Motel 6, and was as big as the other four dorms combined. When I filled out my freshman registration, I picked South Hall because it was co-ed and not quiet. The outside of South Hall in 1990. There are two doors on the second floor between the two central trees--Operative Sasquatch lived in the left of these rooms (with the door open and one mountain bike), and Operative Rodent and Bob lived in the right (with the door closed and two mountain bikes). Running down the center of South Hall was a passageway called the "core". When the swamp cooler in my room blew its circuit breaker, I immediately requested Physical Plant remedy it. Unlike residents of other dorms, South Hall occupants could not access their circuit breakers, and Physical Plant left me and my next-door neighbor sweltering for five days before they got into the core and flipped the switch. All the cables and pipes ran through the core. It was rumored that small dark scratches visible on the dorm mirrors were peepholes through which voyeuristic physical plant employees would view unsuspecting female students. But students weren't supposed to get into the core. Not that we didn't try--there were numerous entrances, but they were all generally kept locked. Until one day, I walked past the student lounge next door to my room and saw that the door to the core was ajar. I casually entered the lounge and gingerly poked open the door to see if the core was vacant. I dashed two doors down to where Operative Torch (Taige Blake) lived, and fetched him. We retrieved flashlights, returned to the lounge and investigated the core. The first thing we noticed was a general neglect of reasonable maintenance standards, just as in the tunnels under Workman Center. There were cheesy plumbing patches and cables strewn all about the place without being fastened down. We also saw why our cable television reception was so awful. There were quite a few long stretches where the coaxial cable had been whittled down to a single strand of copper wire--instead of "co-ax", it was merely "ax". We also looked at the backs of our mirrors, and observed that bits of plywood had been glued and nailed over the scratch marks we saw from the inside. Perhaps the voyeuristic rumors were true. After a few minutes, we had seen everything interesting and departed, closing the locked door behind us to ensure no mischief-makers got into the core after us. The space in Workman Center above the computer center was filled with a complex array of wiring and ductwork. It wasn't normally anywhere near this well-lit; that's just the camera flash. I lived in South Hall for all five years I attended Tech, fall 1987 through spring 1992. I considered moving off campus to save money, but when I mentioned that possibility to my Resident Assistant, he brought up the peculiar relationship I had with his boss--"You can't move off campus! You're the only person on campus Rhonda is afraid of!" And I realized he was right; his boss was widely viewed as out of control by students and administrators alike. When they had tried to evict students out of the dorms at the end of the semester before the last finals, even the RAs were unable to get her to change her mind. I fixed it in five minutes by going to the Institute President. When housing charged West Hall residents a "cleanup fee" for some damage that had occurred after everyone had moved out at the end of the semester, I wrote a newspaper article about it and got them to remove the charges. When a personal squabble came between Rhonda and the Socorro cable television company, she played chicken at the students' expense and threatened to withdraw our cable TV service. In a meeting of what was officially known as the Jurisdictional Body on which we both served, she said cable TV reception on campus was bad because they didn't deliver a good signal. I corrected her, saying that the problem was with Physical Plant's gnawed-away coaxial cables, such as those in South Hall. Five minutes later, she came back to that subject and asked me how I knew about the cables. I simply told her that it was my job to know everything about campus. At that point, I realized that another part of my job was to intimidate the Director of the Housing Department. South Hall had a boring crawlspace. Exploring it had proved useful for intimidating people, but wasn't very fun. The best crawlspaces on campus were directly above the best tunnels on campus, in Workman Center. Workman had so much crawlspace that they were stacked one atop another. 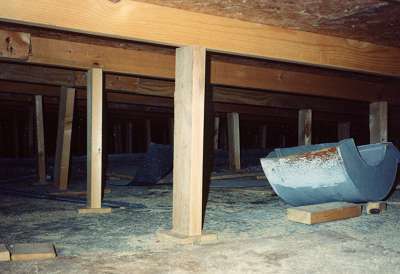 The lower level of crawlspace was above the first floor, adjacent to some of the thirteen second floors. Above the computer center was a particularly interesting space. Operative Sushi attributed this to its past life as collection of large auditorium classrooms. Operative Sushi hangs from an I-beam in the Workman Center roof's lower crawlspace. That's a light bulb in the distance, storage boxes on the right, and ducts all around. There was a room in the far back of the computer center that housed an antique universal power supply. It was a 500-pound motor connected to a rotating 300-pound flywheel and a 500-pound generator. While the massive assembly was no longer in use, it did make a very good footstool for climbing into the crawlspace above the computer center. On the wall of the crawlspace, there was a peculiar porthole that had been boarded up. One day, some of us decided to see what was on the other side of the hatch, and got rough with the sheet of plywood been placed there to discourage us. On the other side of the plywood was a wall of metal. But when a hand reached into the space between the metal and the wall, it encountered something there. Once extracted, it turned out to be a movie reel of an explosion with "CLASSIFIED" stamped in red on the label. We never learned how that got there. Since the movie included an explosion, we presumed it was related to Tech's Terminal Effects Research Analysis (TERA) group, which was generally known for blowing things up in the desert and carefully measuring the explosions. The reigning theory for the movie's location was that we had found our way into a TERA storage room, the wall of metal was the back of a file cabinet, and the film spool we found had long ago fallen behind the cabinet. It certainly wasn't the sort of secure place classified material is generally stored. Above the lower crawlspace was Workman Center's original flat roof. And above that roof was the new slopey roof. Between the two was the upper crawlspace. 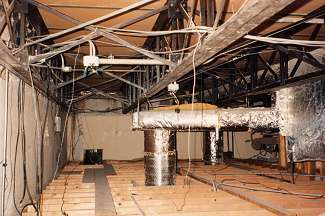 The upper crawlspace gave you an idea of just how shoddy the Physical Plant building standards were. The upper roof was held up by 2x4s propped up on little blocks of wood; some of the 2x4s had slipped away. Every time we inadvertently knocked one down, we were careful to restore it, lest we provoke the roof falling onto us. The space between the original Workman Center roof and the upper roof was filled with junk and shoddy construction. Note that the 2x4s holding up the upper roof are held in place only by the weight placed upon them. The construction process that could lead to this state completely eludes us. There was a wide assortment of debris in that crawlspace. Most was junk like ducting and lumber, but some had value. Operative Rodent found a vacuum pump that he donated to an individual I'll refer to as "ER". * This ER set a high standard for recklessness that Stealth Force Beta could never match. He would have thought nothing of things Beta medals were given for--facial collisions with grappling hooks and skin-scraping escapes from greasy elevator pits were right up ER's alley. (A few years later, ER went to volunteer to fight for either side on the war in Bosnia to see what war was like.) ER also found that the vacuum pump Rodent donated wasn't powerful enough to maintain a vacuum suitable for growing anthrax, so he found an alternate use. One day as I ate lunch with Operative Rodent, ER's roommate approached in a near panic and thrust a note at us. The note, in ER's handwriting, explained that he had accidentally dropped onto the kitchen floor the botulism culture he had been attempting to cultivate in the refrigerator. The glass vessel had broken, and the note encouraged care in the kitchen until ER returned to tidy up. ER had found the perfect campus job for a person of his inclination and regard for personal safety--he held a student job mixing explosives. ER lived on the fringes of town near the railroad tracks, and he had enough space to build things. He made a crossbow out of a pair of truck suspension springs, and found a fireplace poker to serve as an arrow. He used a truck cargo load ratchet to pull back the arrow, and fired it into a fencepost twenty feet away. Even though he fired the poker with the blunt end first, it still embedded itself solidly into the wooden post. 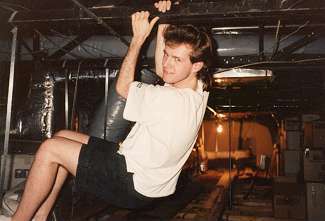 Operation Crawlspace was pointless in that it never came in handy for other missions, the way exploring the roofs in Operation High Exploration led to the magnificence of Operation Public Hanging. But it did keep us from getting into bigger trouble those late nights in New Mexico. * If you're ER and wouldn't mind having your full name printed here, let me know.